Scrub beets well, dry, and coat with a little olive oil. Place beets in an ovenproof pan, cover with foil, and roast at 350 for 40-45 minutes, or until knife tender. When beets are cool enough to handle, remove the skin, and cut into slices. 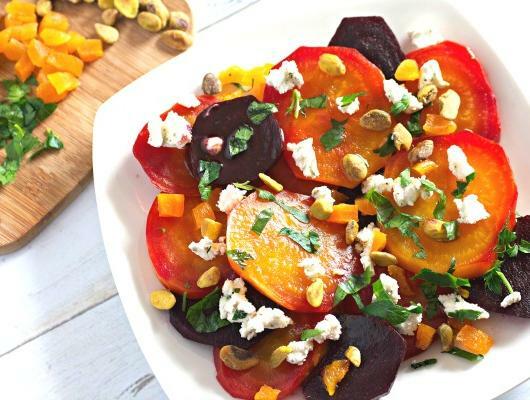 Place beets on a serving platter, sprinkle with goat cheese, chopped apricots, and pistachios. In a small bowl, combine olive oil and balsamic vinegar and mix well. Drizzle over beets. Serve immediately. 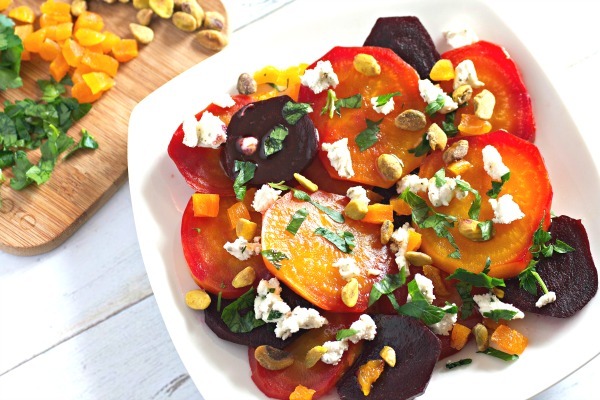 Easy and healthy, this beet salad is perfect for Easter brunch or dinner and as a salad course or as a vegetarian side dish. Leftovers are wonderful for lunch too!